Chances are, you think more about hobbies at the beginning of the year – when resolving to try something new – than you do as autumn approaches. But for older adults, this time of year can represent a big gap: Summer has ended and the holidays are still in the distance. Activities and visits from family can wane as fall begins, making it an ideal time to introduce or renew focus on a cherished hobby. The calendar of national observances for September supports the fall hobby concept. For animal lovers, there’s Dog Ownership Month or Happy Cat Month. Foodies have Ethnic Foods Month. Music lovers can choose from Piano Month or Classical Music Month. For readers, Library Card Sign Up Month. Fashionistas can celebrate Fall Hat Month. And it doesn’t stop there. With so many observances as fall gets underway, you’re likely to find local activities that will allow for exploring a variety of hobby possibilities. How can you find an activity that’s not only the right fit for the older adult in your life, but that also provides health benefits? Here are FirstLight’s five tips for finding the right hobby to fill the fall gap. Go with what you know (and love). The simplest activity to incorporate into an older adult’s life may be the one they’re already familiar with or have dreamt about doing. Consider renewing a focus on an activity that may have been loved during years gone by, but was forced out of the schedule when days were filled with working or raising children. Or dust off that bucket list and do something that’s always been a personal aspiration. Be adaptable. The physical or cognitive limitations that often come with aging don’t have to prevent older adults from enjoying activities they love. Many hobbies can be adapted to changing abilities. For example, a person who used to spend hours in the garden could create a potted version on a deck or porch. A former runner could take up nature walking. Being adaptable can lead to new ways to enjoy old interests. Get social. Hobbies that involve social interaction can provide compelling health benefits. According to the University of Rochester Medical Center, people who continue to interact socially live longer than their isolated counterparts. In fact, social interactions are shown to improve mental health, as well as protect against certain illnesses by boosting the immune system. Move it. There’s a mountain of medical evidence that physical activity is integral to good health. According to the National Institutes of Health, even moderate physical activity can help older adults prevent or delay disease, manage stress and improve mood. To maximize the health benefits, consider hobbies that incorporate physical activity. Popular, low-impact options for older adults include walking, swimming and Tai Chi. Use your head. According to the World Health Organization, common factors such as isolation, loss of independence and loneliness can take a significant toll on the mental health of older adults. And declining mental health can affect mood, energy, sleep, appetite and physical health. Hobbies that stimulate the mind – reading, music, puzzles, games and more – can help boost mental health. And they may also contribute to preserved mental function. 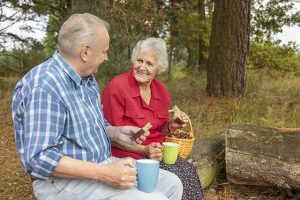 FirstLight caregivers can help your loved one fill the “fall gap” with the hobbies and activities he or she loves. Our Companion Care Services include visits, conversation, company and recreational activities. To learn more, find a location near you today.